You are here: Home / News / Client News / How far to go viral? How far to go viral? 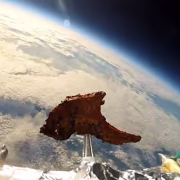 Have you ever seen a tandoori lamb chop fly to space? No? I didn’t think so. Neither had I until earlier this week when an incredibly bizarre video emerged from the depths of the Internet. 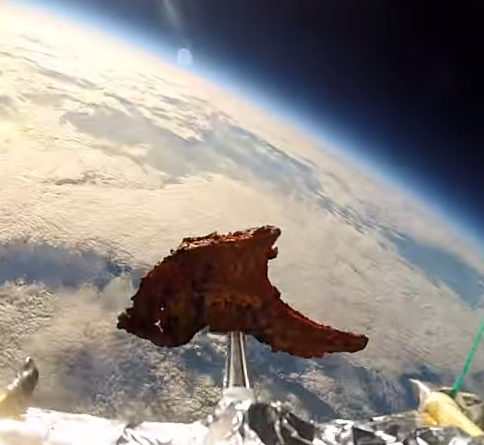 This video came about when a marketing team strapped a GoPro camera onto a tandoori lamb chop, attached it to an inflated weather balloon and launched it 31km into the stratosphere. This story struck a chord with me as it reiterates how far (literally) marketing and advertising campaigns have to go to make an impact. No longer is a simple print or TV ad enough to draw in the eyes of consumers; now you have to be big, bold and viral. Whether it’s a CGI Penguin, a Devil baby or a tandoori lamb chop flying into space, campaigns have to work harder than ever before. So what’s the secret to viral success? Of course, campaigns need to work across multiple platforms and devices, have an innovative idea, some kind of consumer hook, but even that’s not enough. It sounds utterly exhausting, but I’m beginning to believe that being virtually triumphant boils down to something much more simple, emotion. So back to the lamb chop – you might hate, love or feel completely indifferent towards the video, but it does show that marketing teams will push every boundary to go viral and connect with its audiences. The popularity of this video is only set to grow with each share and mention. No matter how big a campaign may be, the power of its success ultimately lies with its audience. https://www.platformcomms.com/wp-content/uploads/Screen-Shot-2014-11-28-at-11.03.14.png 445 484 Platform Team /wp-content/uploads/platform-communications-logo-niagara.png Platform Team2014-11-28 11:31:052017-02-25 16:54:19How far to go viral?